What is the Interest Rate on Loans or Savings? An interest rate is a number that describes how much interest will be paid on a loan (or how much you’ll earn on interest-bearing deposits). Rates are usually quoted as an annual rate, so you can figure out how much interest will be due on any amount of money. Depending on the situation, interest can be quoted and calculated in a variety of ways. When you deposit money in a bank account or similar account, you basically lend that money to the bank and earn interest. Some banks offer higher interest rates than others. When you borrow money, you pay interest in exchange for using somebody else’s money. What is the Interest Rate You Earn? When you deposit money at the bank, you may earn interest on that money – especially if you deposit into savings accounts or certificates of deposit (CDs). However, accounts that allow daily spending, such as checking accounts, often don’t pay interest (unless they’re high-yield or online checking accounts). The bank takes the money you deposit and uses it to earn more money. The bank will invest the funds by lending to other customers (offering auto loans or credit cards, for example) or investing in other ways. APY: interest you earn at a bank or credit union is typically quoted as an annual percentage yield (APY). For example, a savings account might pay 2% APY. APY is typically used because it takes compounding into account. The actual interest rate you earn is often lower than the quoted APY, but after compounding (earning interest on top of interest you previously earned) you can earn the full APY. If you leave your money untouched, you should earn a return equal to the APY over one year. Because the rate is a percentage, you can calculate how many dollars you’ll earn no matter how much you deposit. There are several ways to calculate interest earnings, including spreadsheets, online calculators, and handwritten equations. What is the Interest Rate You Pay? When you borrow money, lenders demand that you pay them for their risk – they don’t know if you’ll repay the loan, so they want compensation. APR: interest rates on consumer loans are often quoted with an annual percentage rate (APR). That number tells you how much you can expect to pay for every year you use the money, and it includes fees above and beyond interest costs. As a result, APR can be inaccurate (if you don’t keep the loan for as long as you expected, for example). For a cleaner calculation how much you pay for interest costs only, calculate simple interest charges instead. When you pay interest, the money is gone for good. It may be possible to deduct some interest costs (as a business expense, or as part of a home that you own), but that’ll only cover a portion of your total cost. The lower the better: it’s usually best to pay interest at the lowest rate possible. However, there may be situations when you prefer (or simply need to accept) a higher interest rate loan – especially for shorter term loans. When comparing rates, look closely at all of the costs involved. Lenders can manipulate things to make it look like you’re paying less than you are (by quoting a low-interest rate or monthly payment, but jacking up the price of a car, for example). Always run the numbers yourself and compare options before you commit. 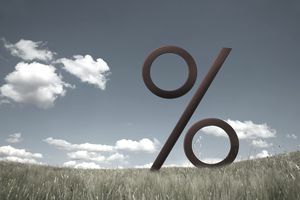 Whether using APR, APY, or another way to quote interest, rates are typically quoted as a percentage. That means it’s fairly easy to calculate interest earnings or costs. The word percentage means “per one hundred.” As a result, you can estimate interest on every hundred dollars you borrow or deposit. For example, assume your bank pays 2% APY on your savings. For every $100 you have on deposit, you can expect to earn $2 over the course of one year. Put another way, you’ll earn two dollars per hundred dollars. Whether or not your rate will change depends on the type of account you’re using. Rates of return: besides standard interest rates, some investments have a rate of return (if they don’t lose money). A rate of return is different from a quoted interest rate because there might not be any guarantee that you’ll actually earn a rate of return. Interest rates, although they can change, can typically be counted on until a published change happens.